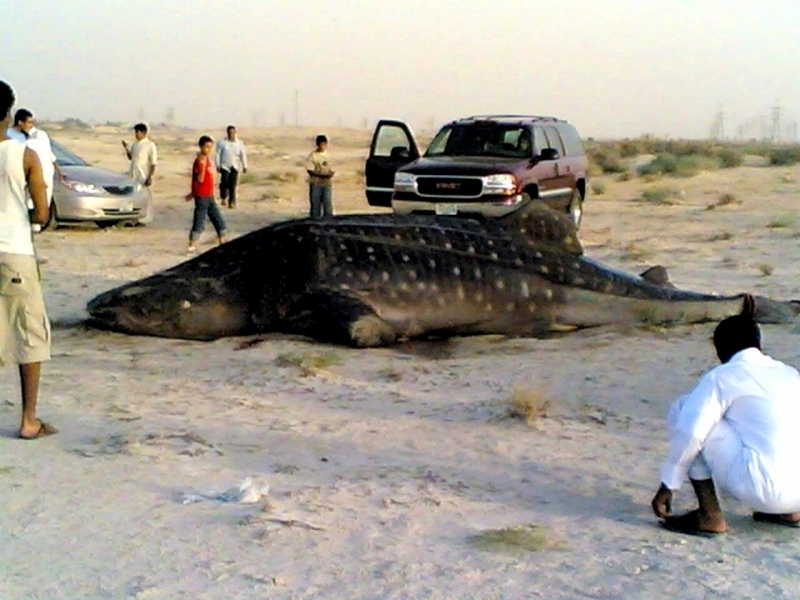 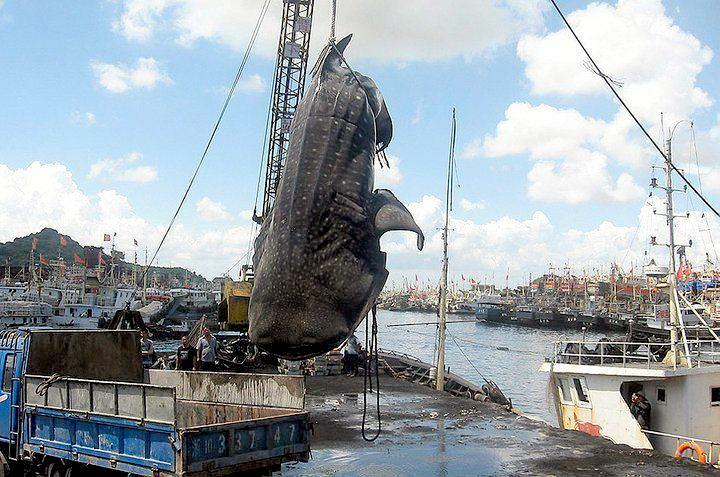 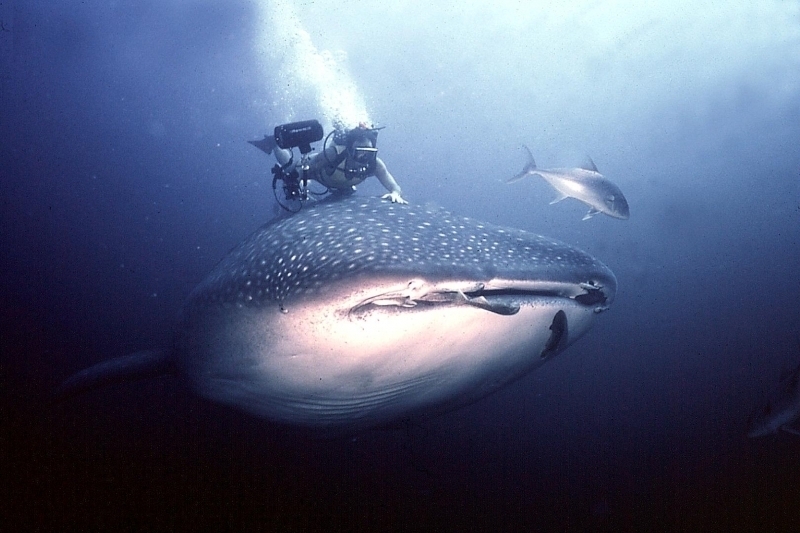 Whale Sharks are the biggest shark as well as the biggest fish in the ocean. 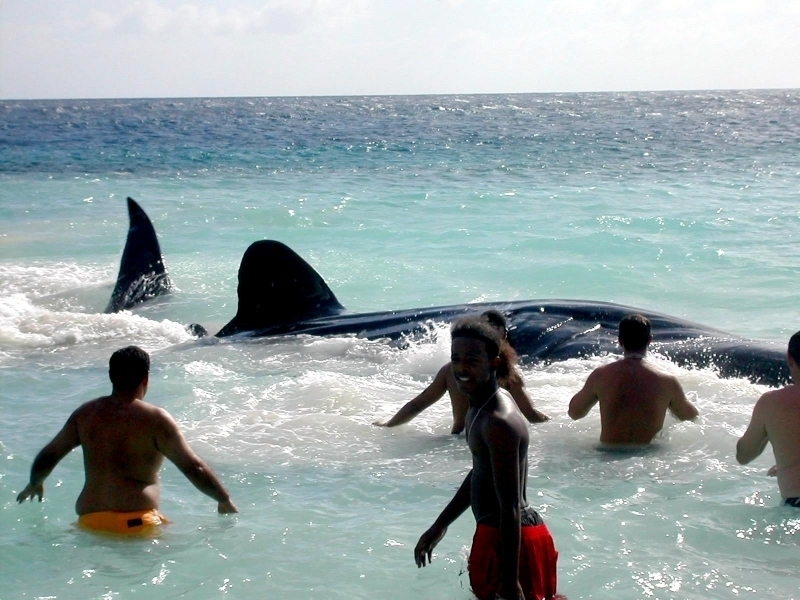 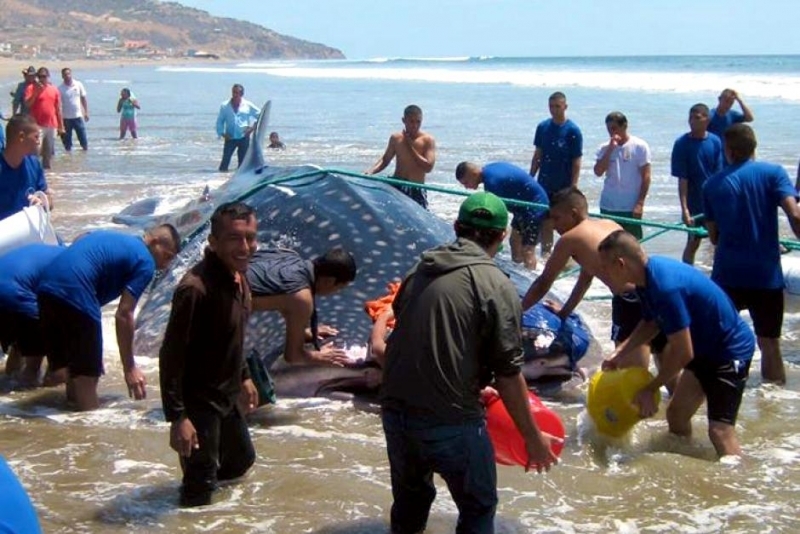 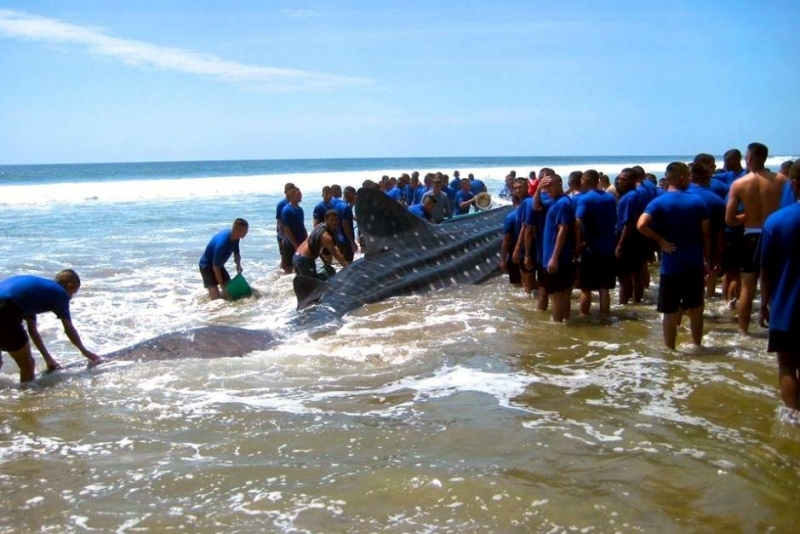 They are not a whale nor are they dangerous to humans. 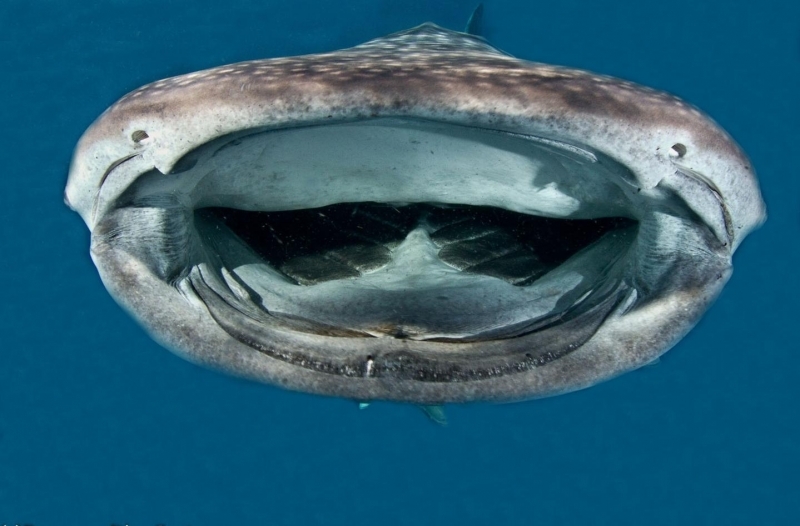 They have a distinctively wide mouth at the very front of their head rather than on the underside like most sharks. 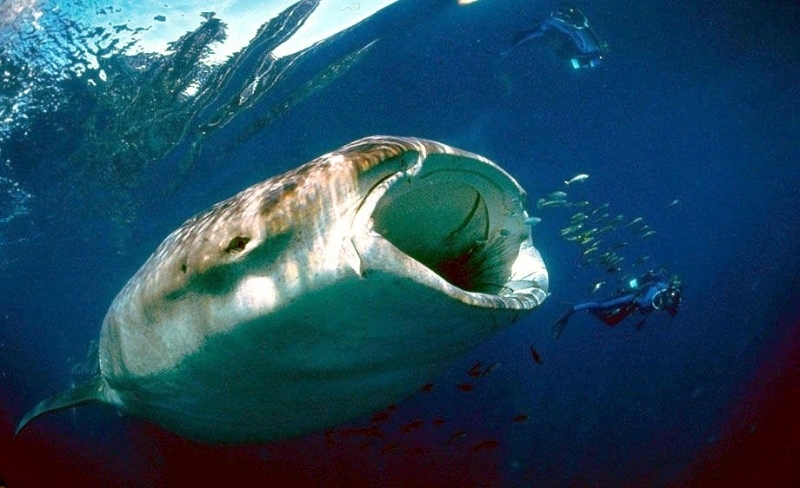 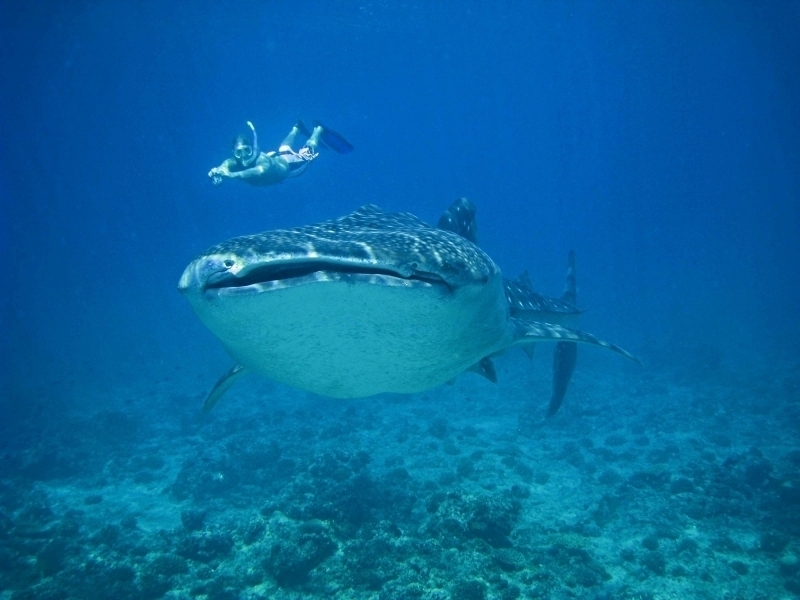 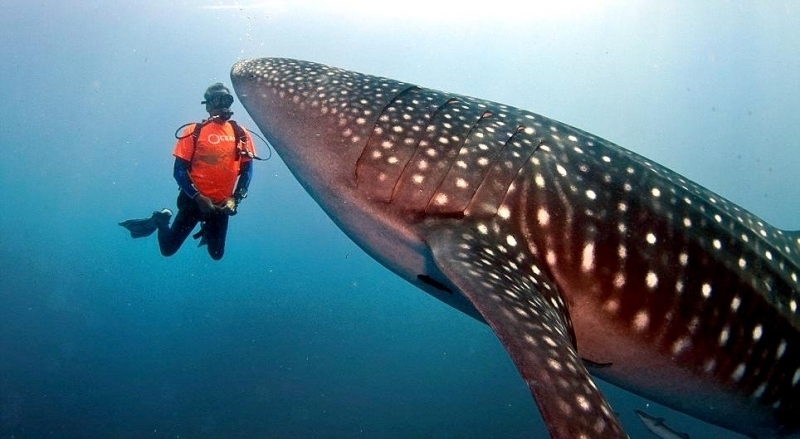 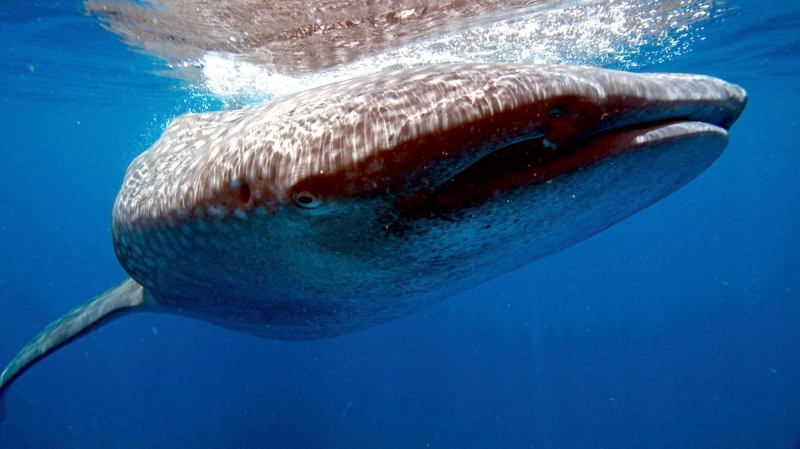 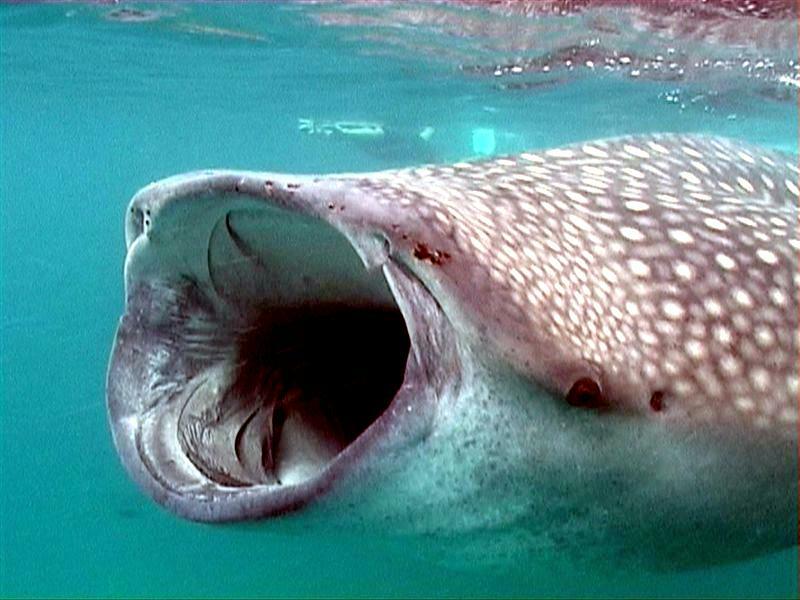 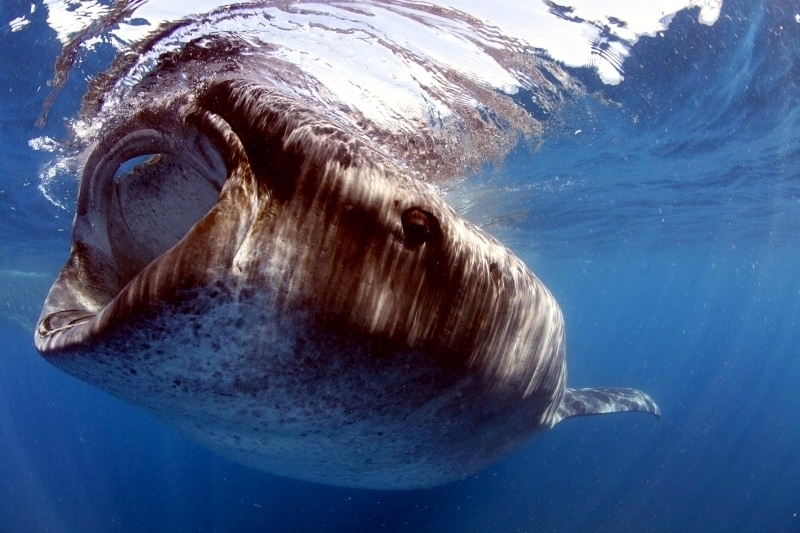 Whale Sharks have wide, flat heads, rounded snouts, small eyes, 5 very large gill slits, 2 dorsal fins & 2 pectoral fins. 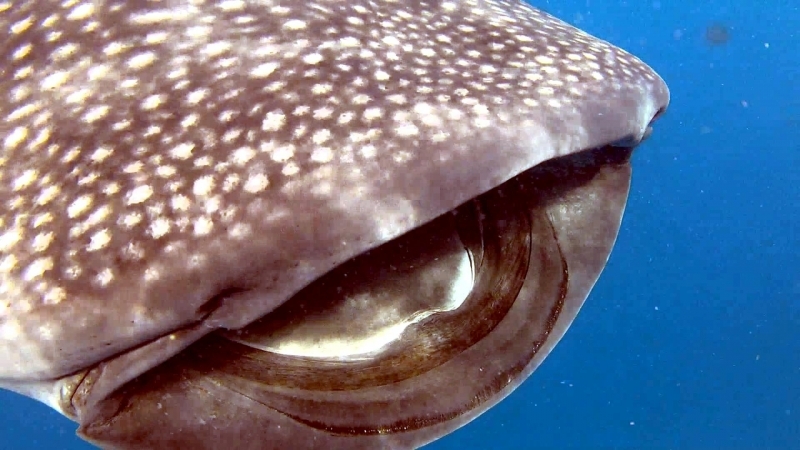 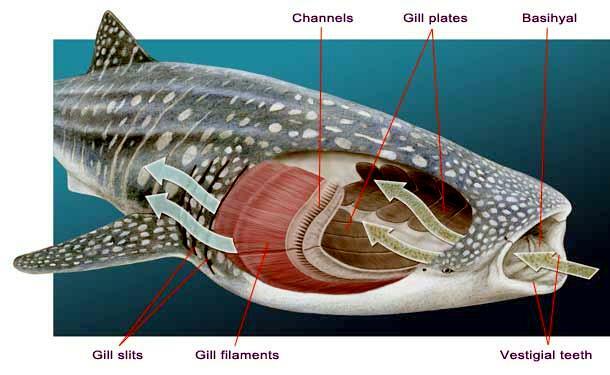 The spiracle vestigial first gill slit used for breathing when the shark is resting on the sea floor, is located just behind the eye. 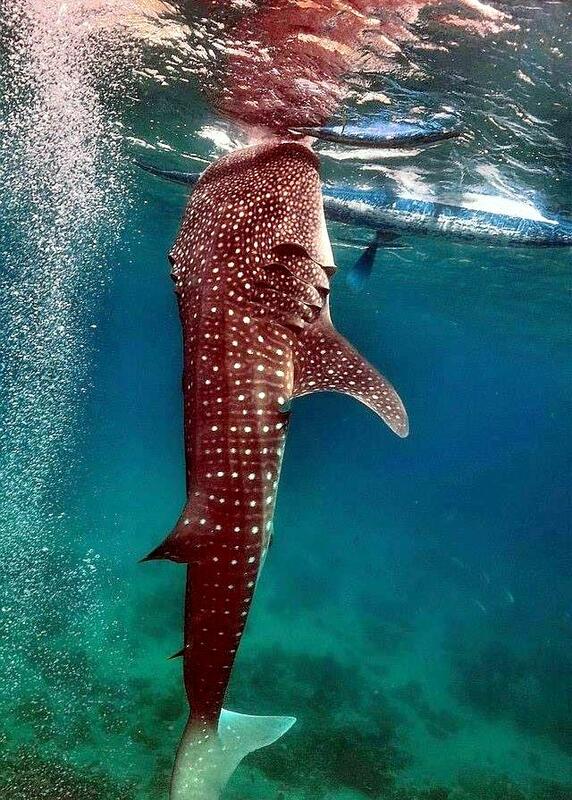 Its tail has a top fin only slightly larger than the lower fin. 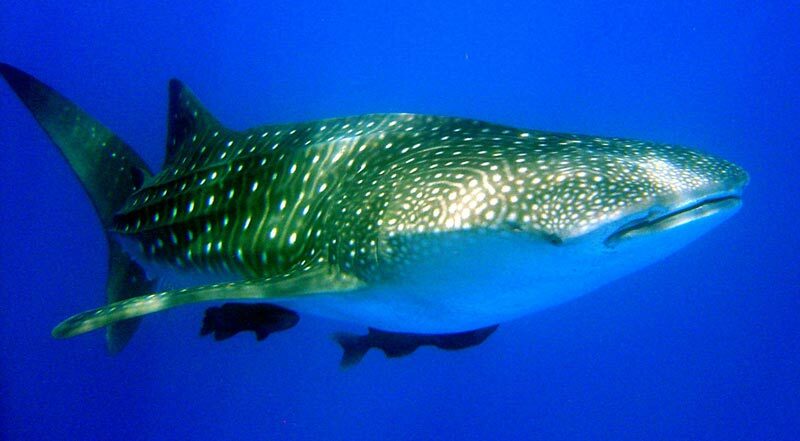 Whale Sharks have distinctive light-yellow or white markings (random stripes and dots) on their very thick dark gray skin which is up to 10 centimeters thick. 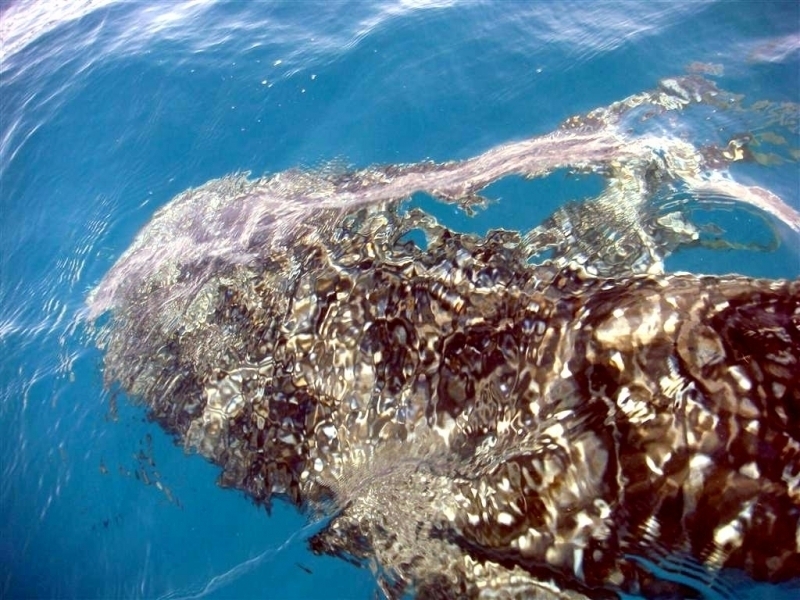 They also have 3 prominent ridges running along each side of their body. 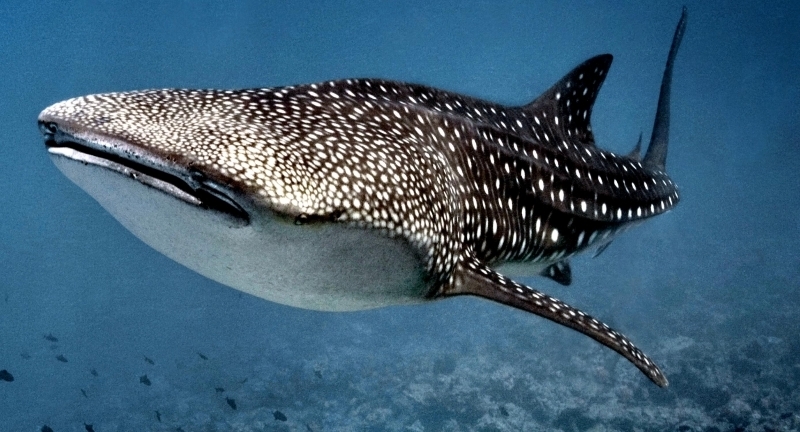 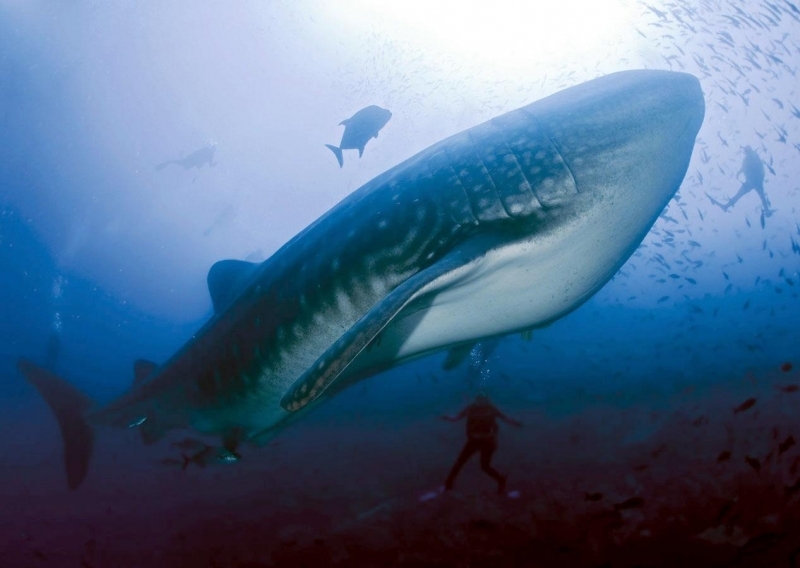 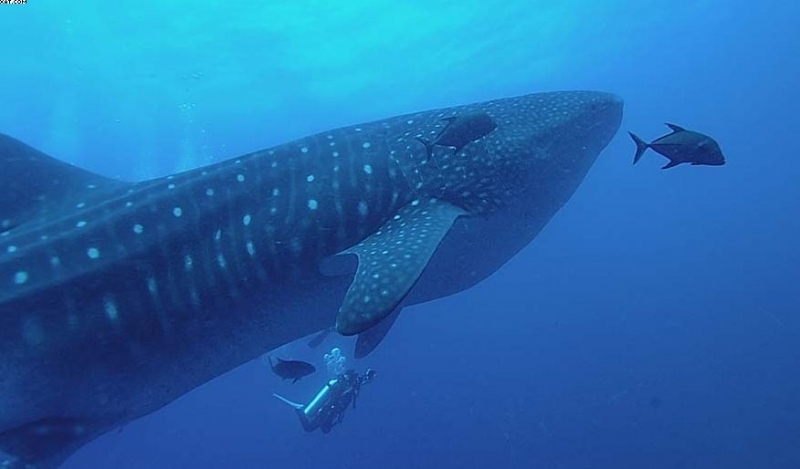 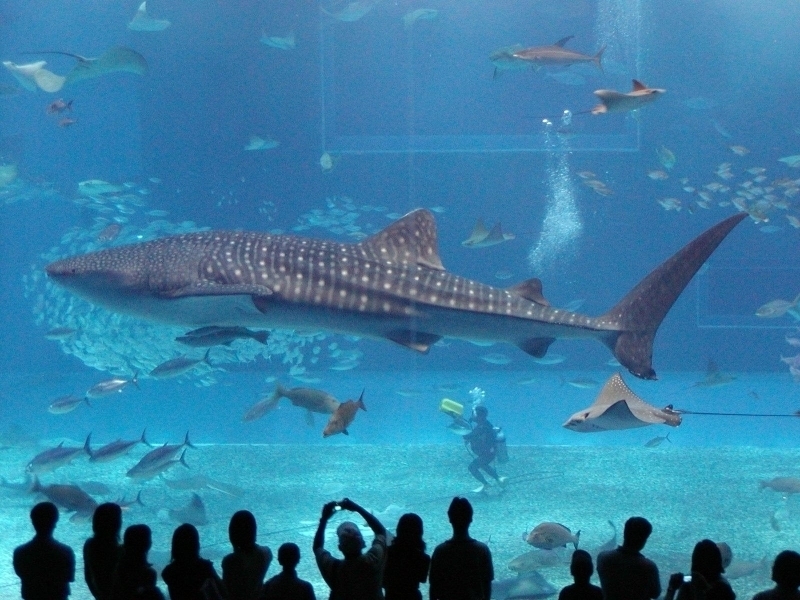 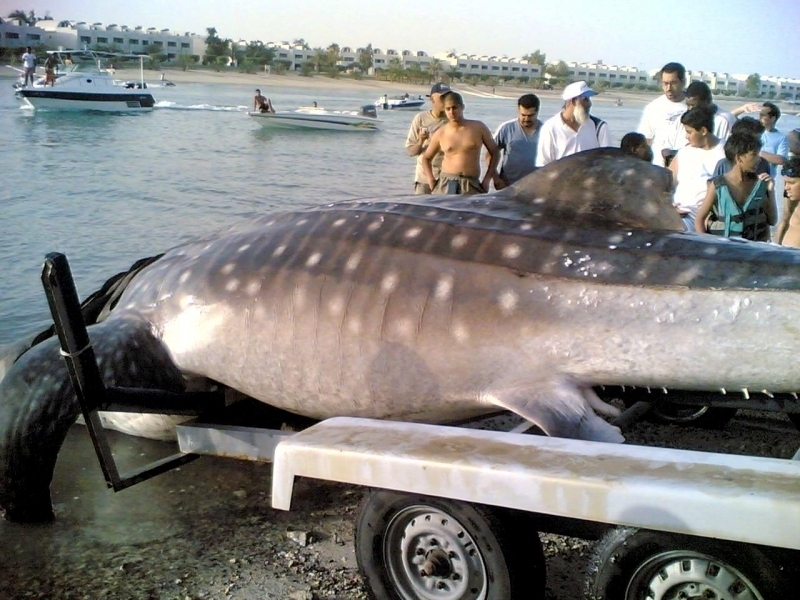 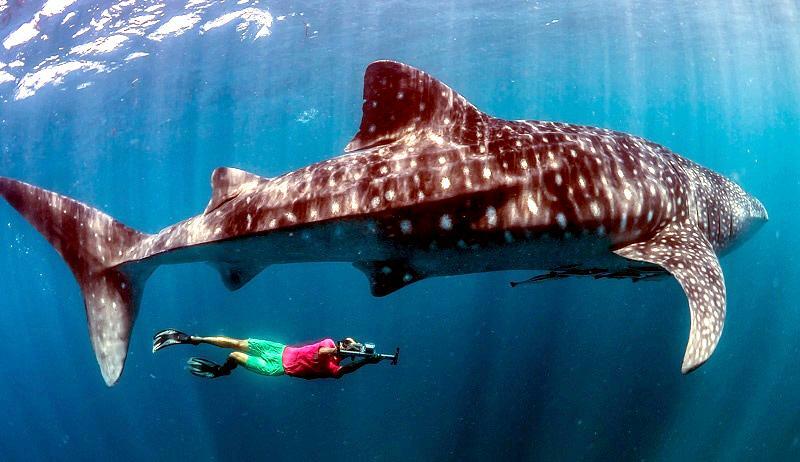 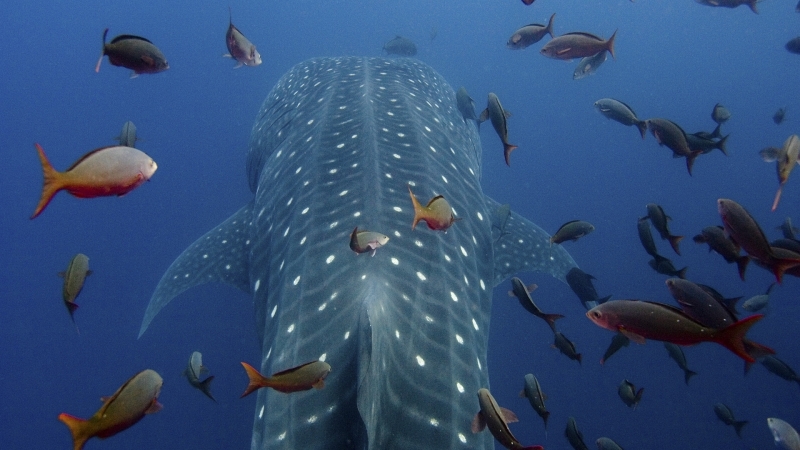 Whale Sharks measure up to 20 meters long and weigh up to 34,000 kilograms. 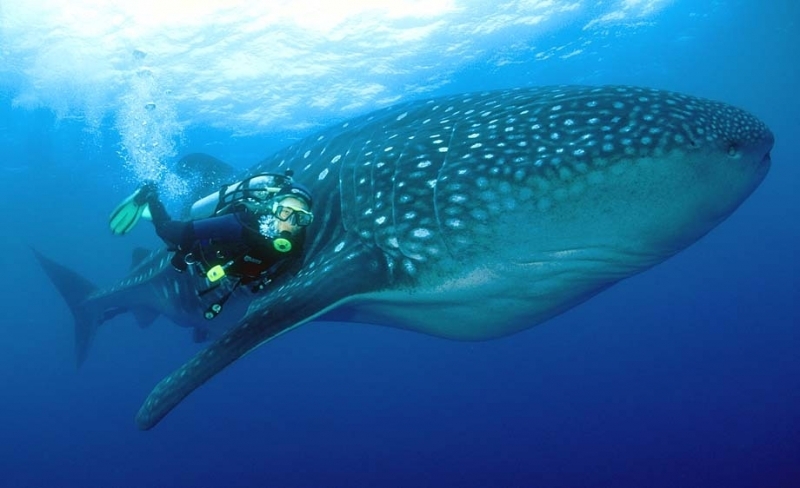 Most individuals encountered are between 6-12 meters long. 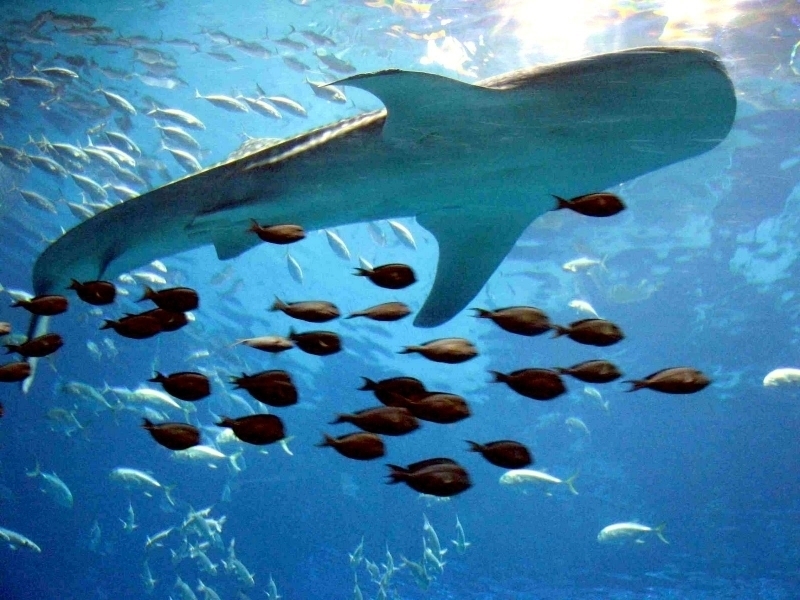 Like most sharks, the females are larger than males. 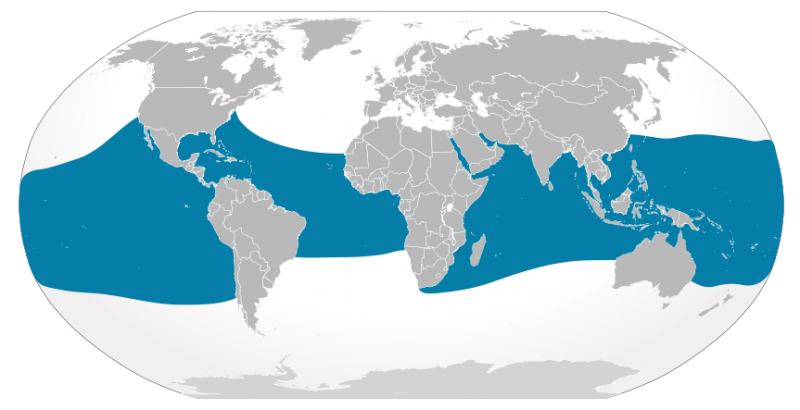 Whale Sharks have a very widespread distribution, occurring in all tropical & warm temperate seas, except in the Mediterranean. 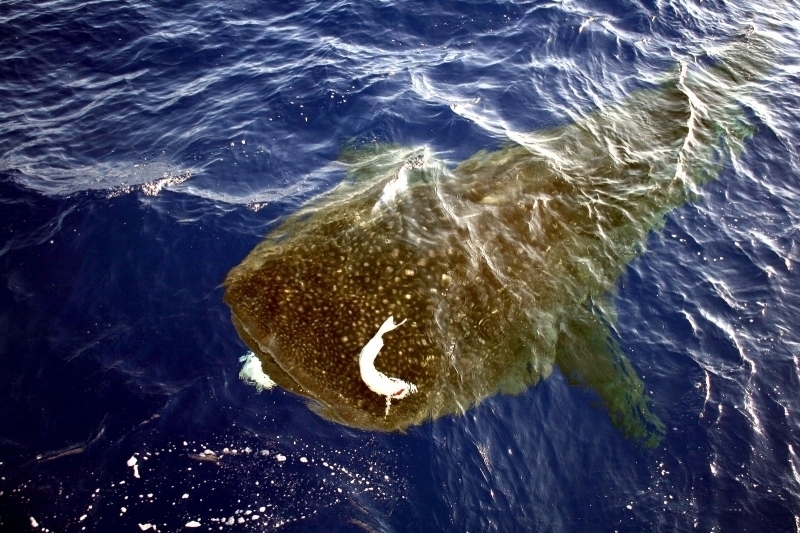 During the day, they spend most of their time feeding near the surface, preferring sea surface temperatures around 21-30 °C. 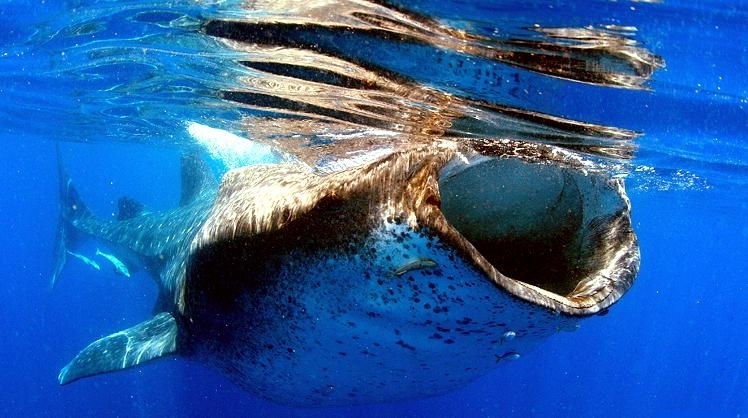 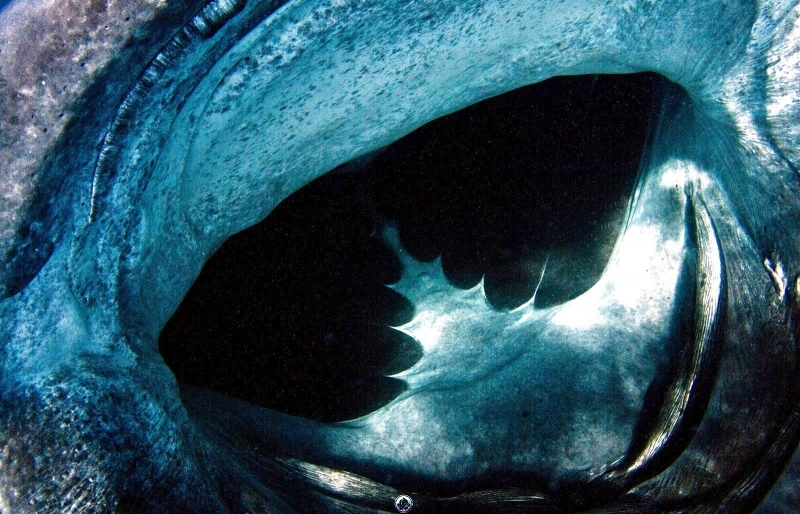 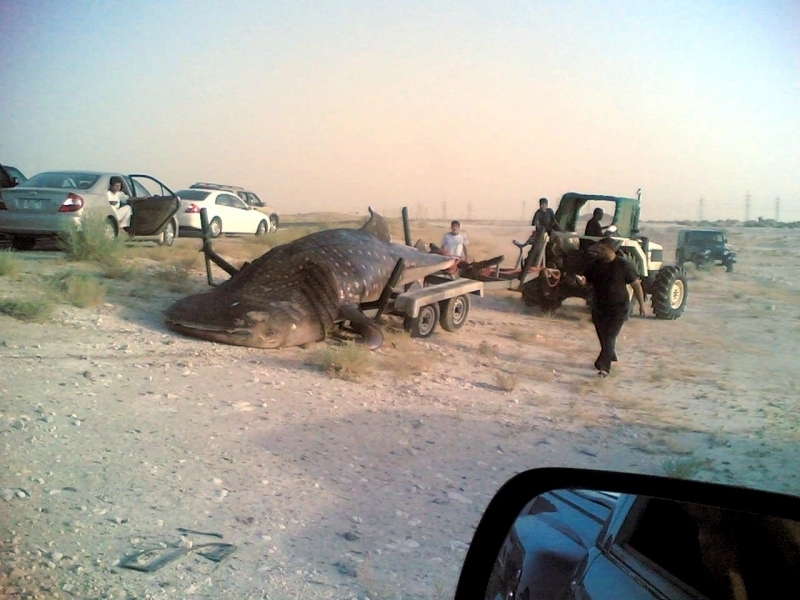 They often go deep at night and when traveling, reaching depths of more than 700 meters. 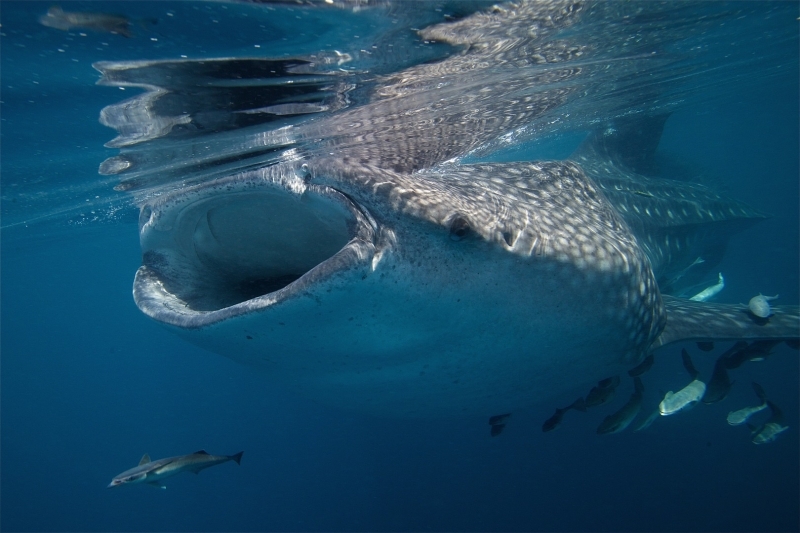 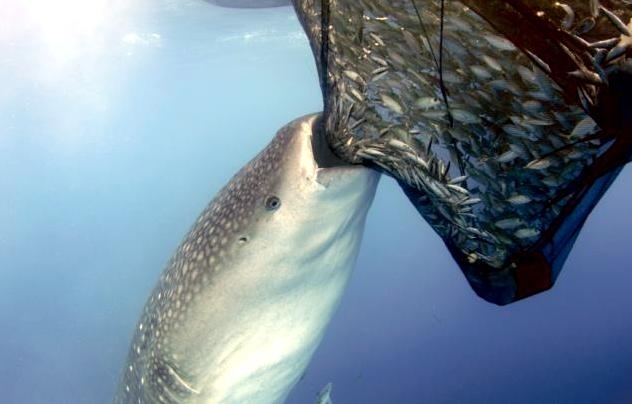 Whale Sharks are filter feeders, sieving enormous amounts of plankton, krill, small fish and even squid through their gills as they swim along. 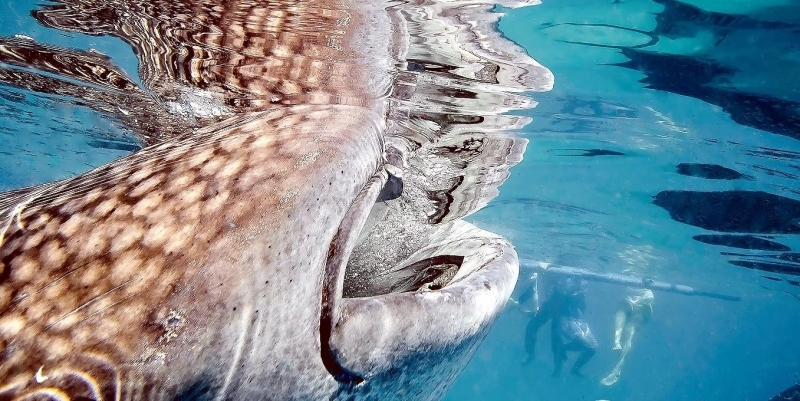 After closing their mouth, they use their gills rakers which are thousands of bristly structures about 10 centimeters long, to clean the captured prey from its gills and anything that doesn’t pass through the gills is eaten. 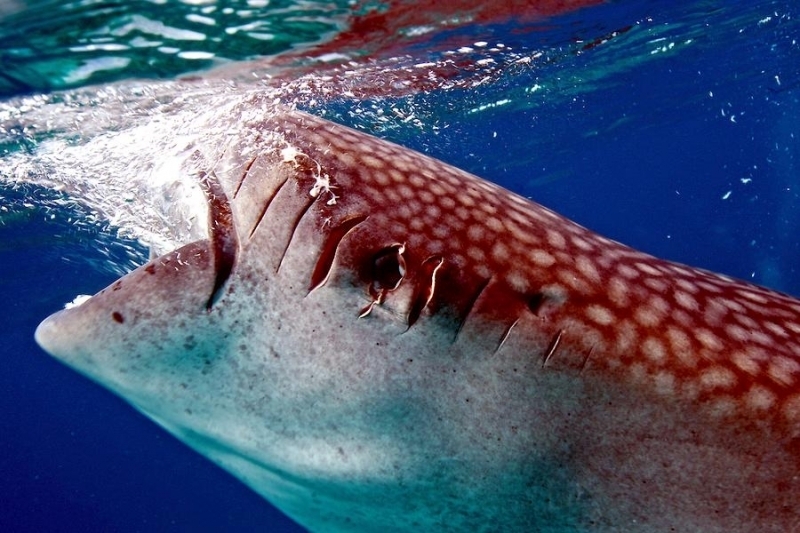 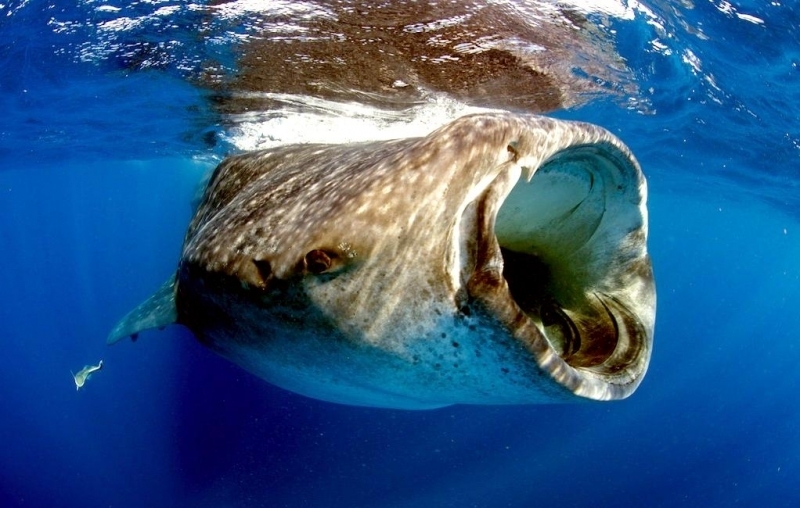 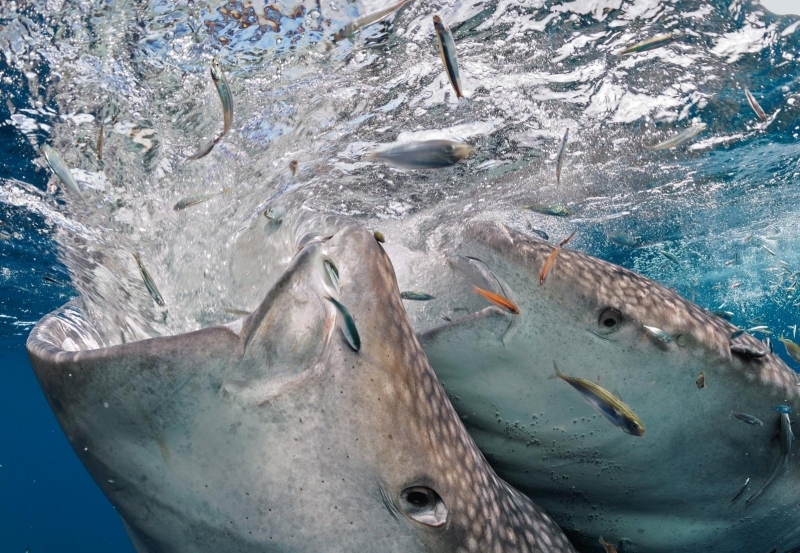 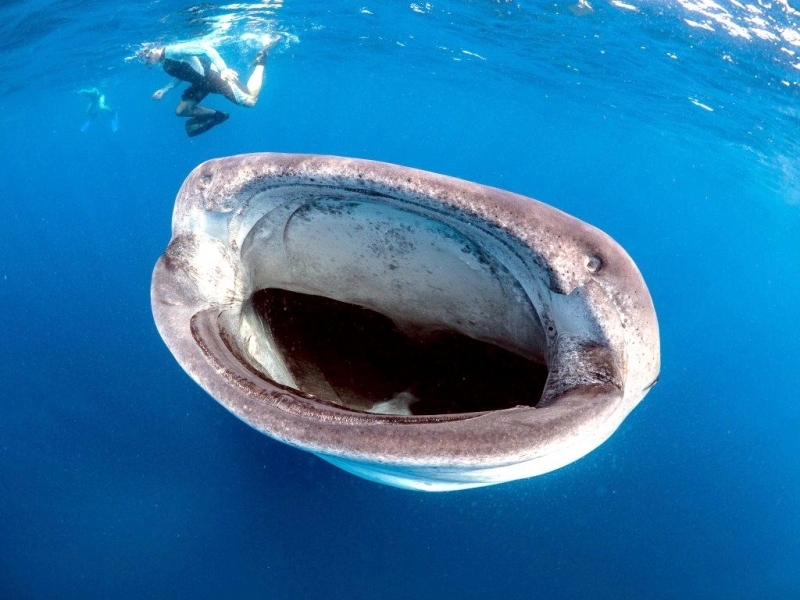 Whale Sharks sometime assume a vertical orientation in the water, rhythmically rising partially above the surface and sinking below with mouth wide open, allowing plankton-bearing water to flush through the gill rakers. 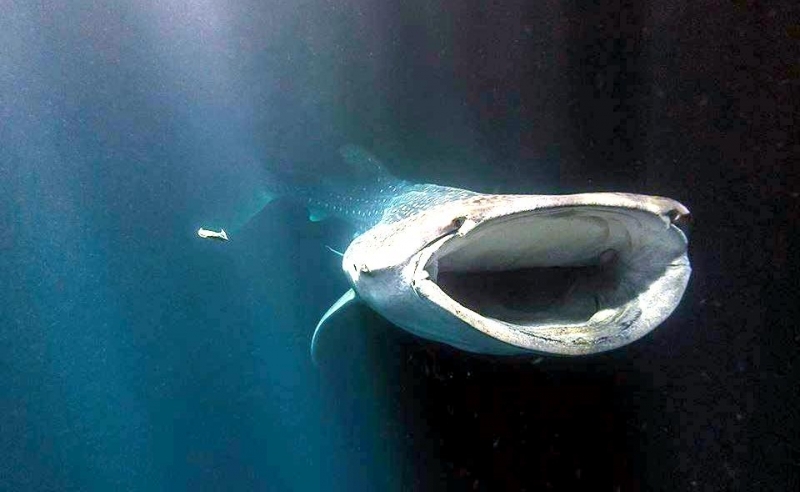 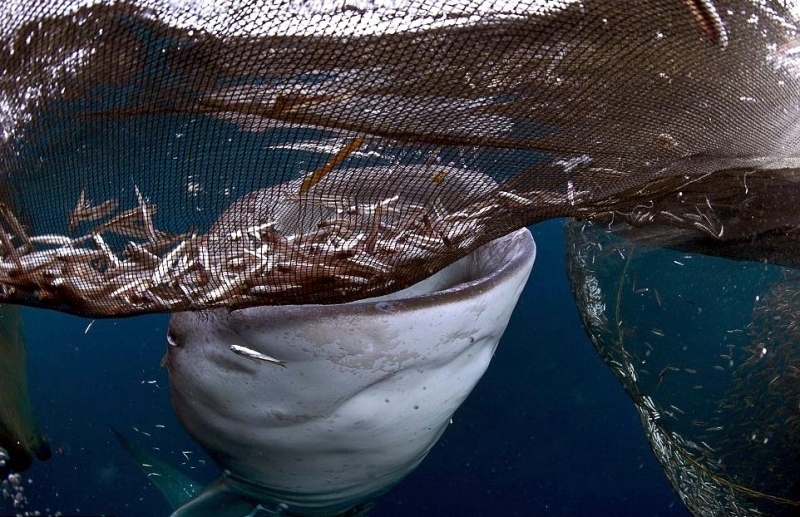 Whale Sharks can filter over 6,000 liters of water an hour and have about 27,000 very tiny teeth arranged in some 300 rows but they are of little use in feeding. 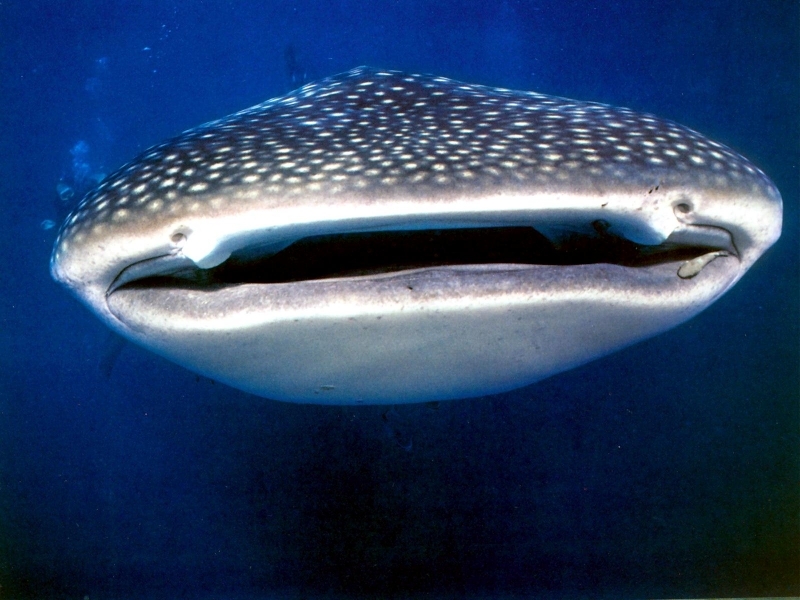 Whale Sharks are oviparous. 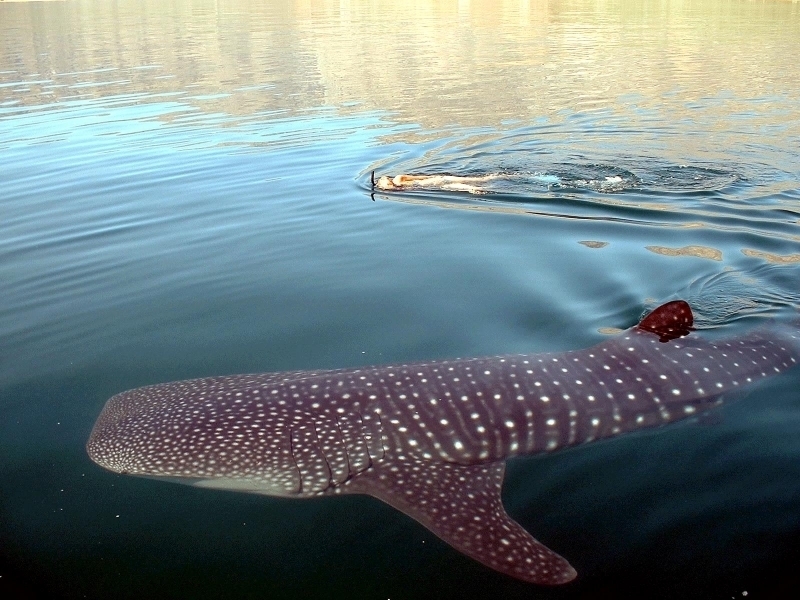 Pregnant females carry their pups numbering in the hundreds giving birth to live young. 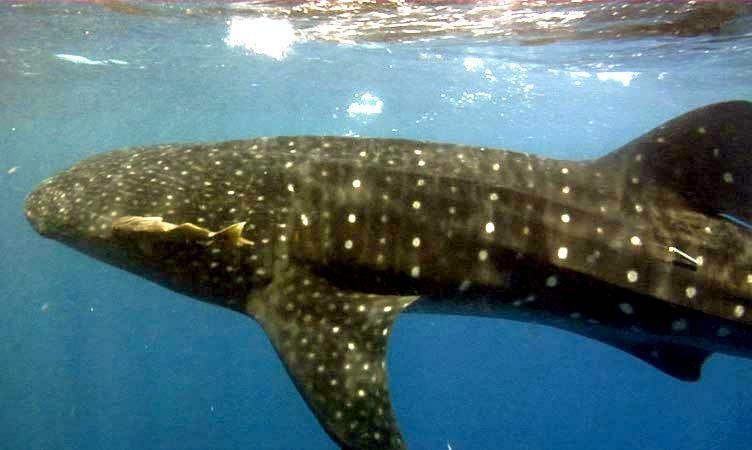 Newborns are over 60 centimeters long. 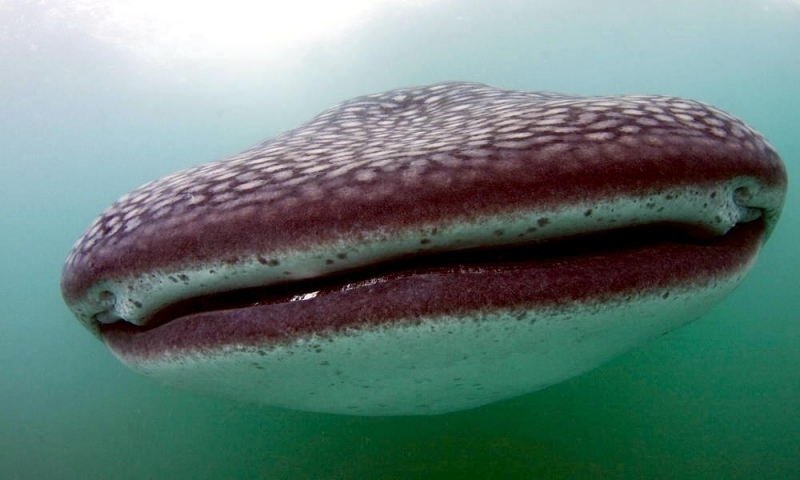 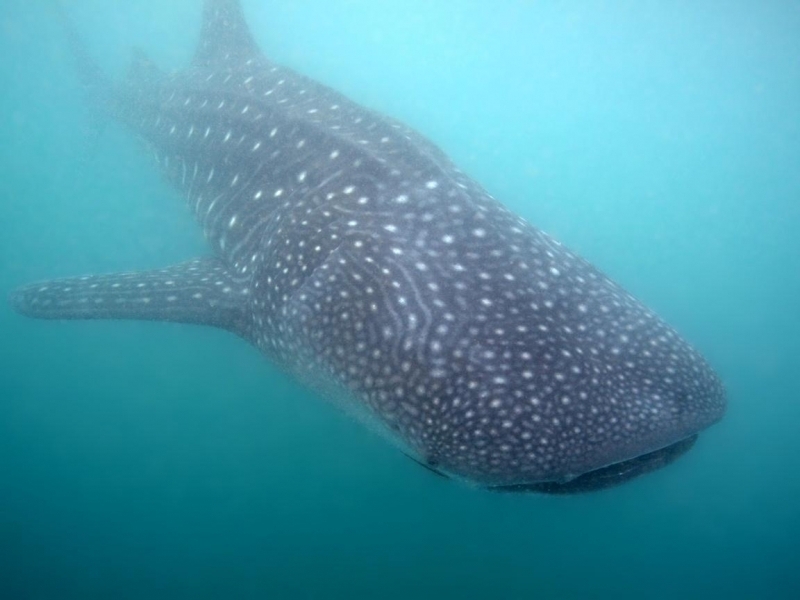 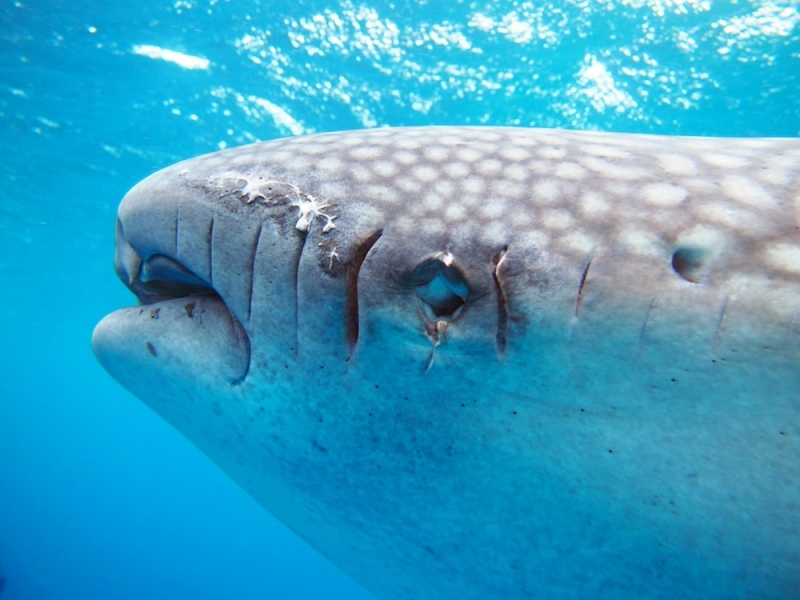 It has been calculated that Whale Sharks reach sexual maturity at 30 years old and may live to be 100-150 years old, but no one knows for sure. 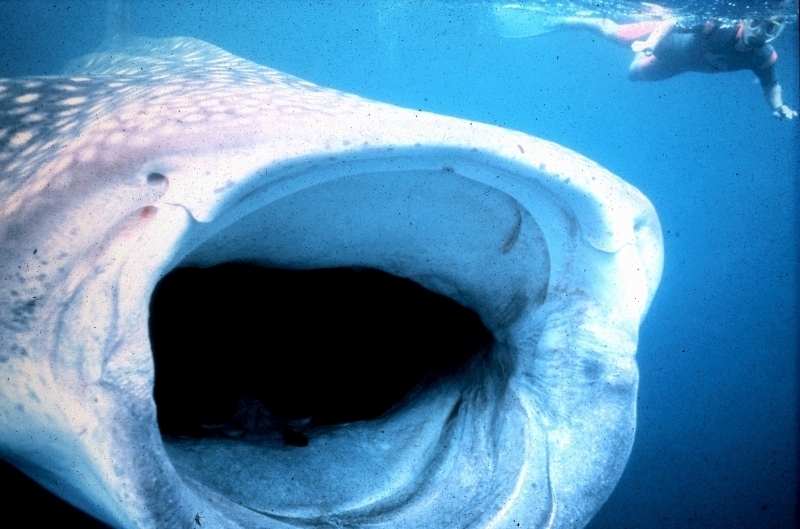 Whale Sharks are generally solitary creatures. 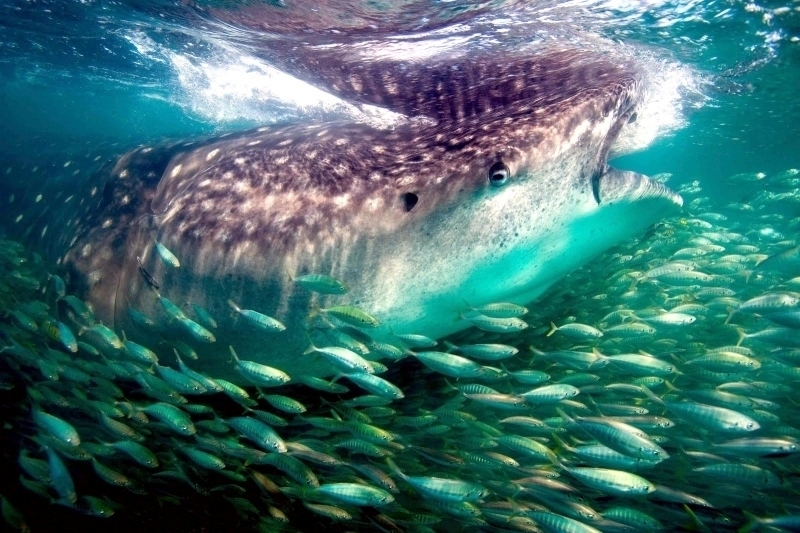 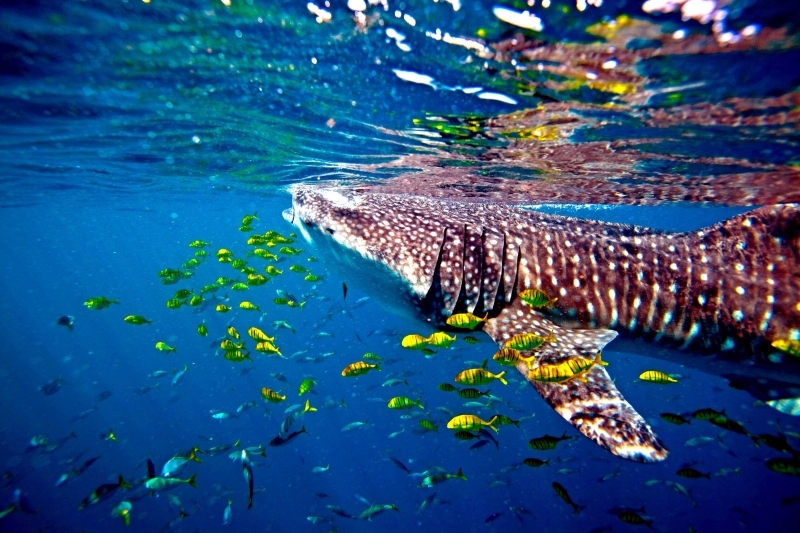 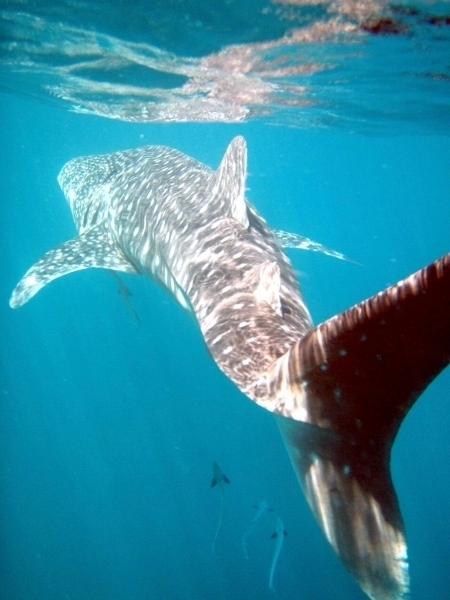 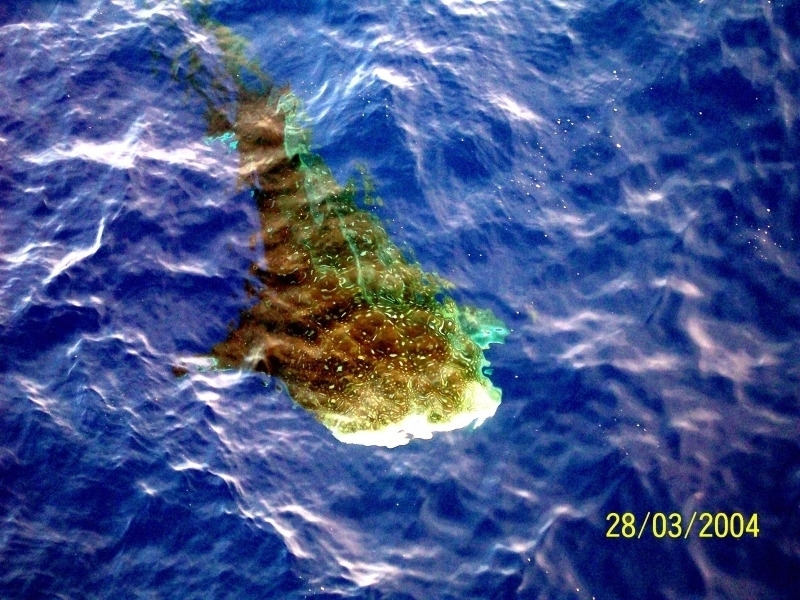 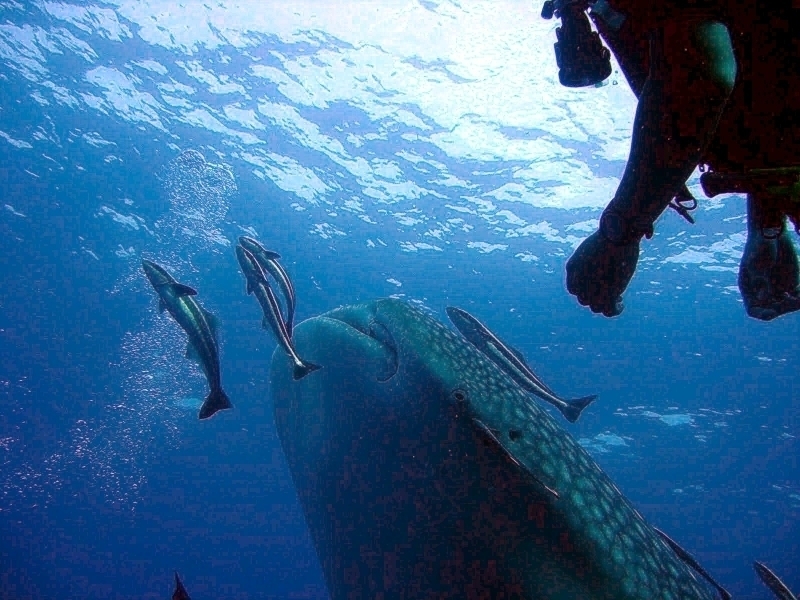 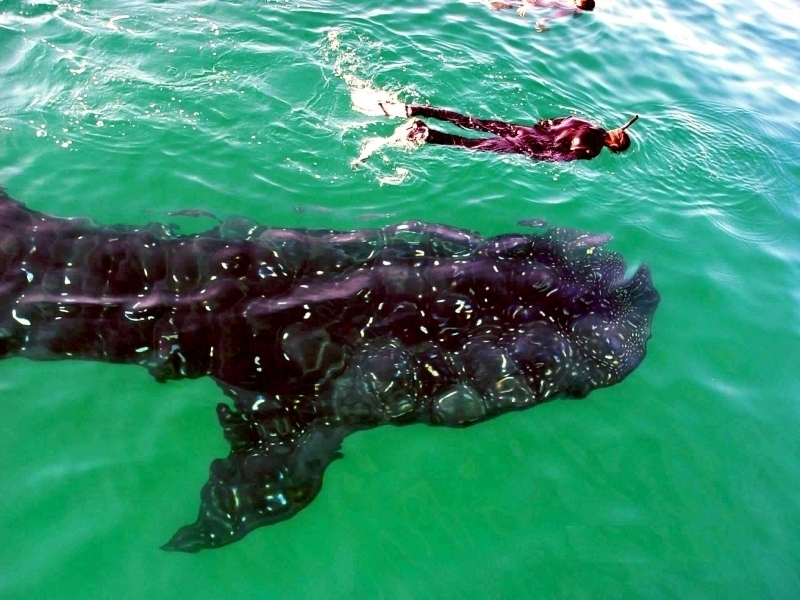 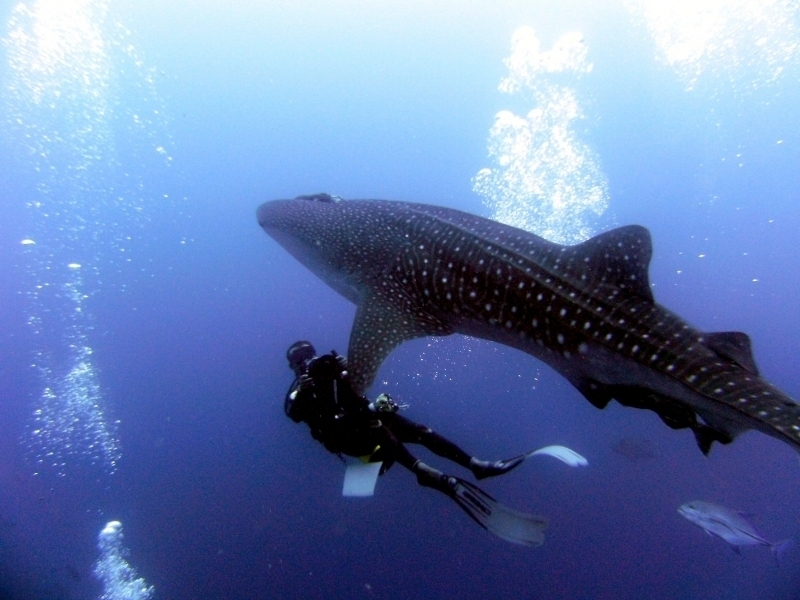 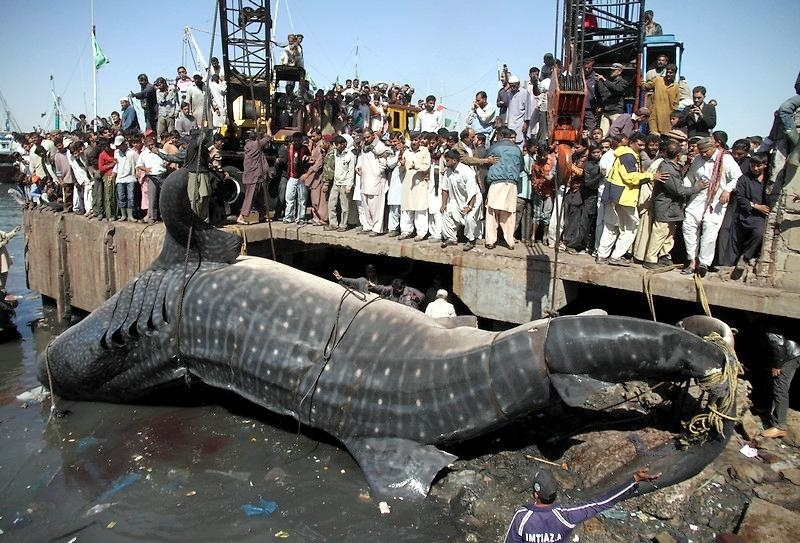 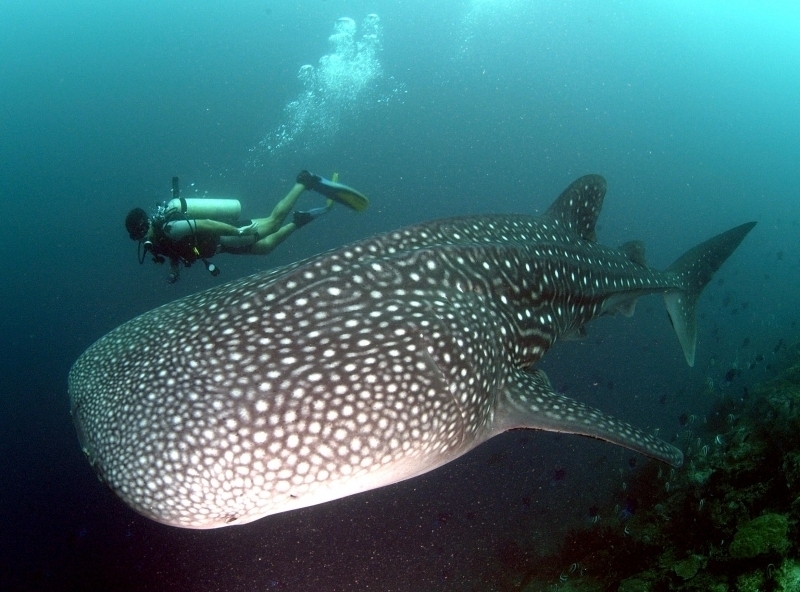 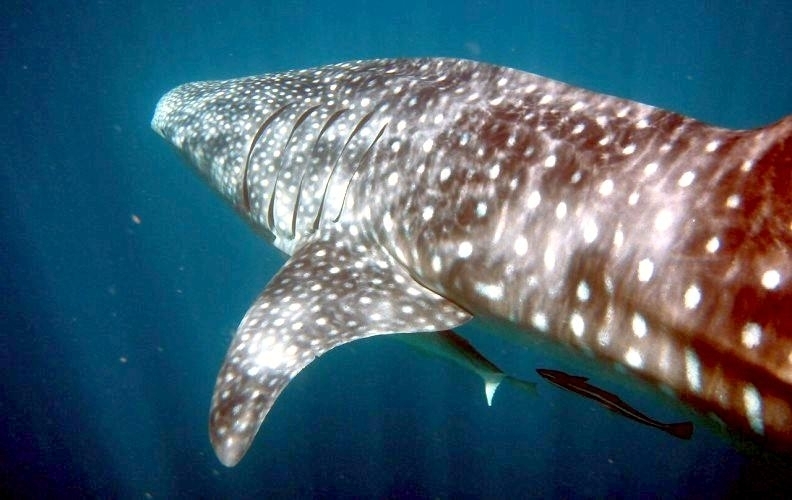 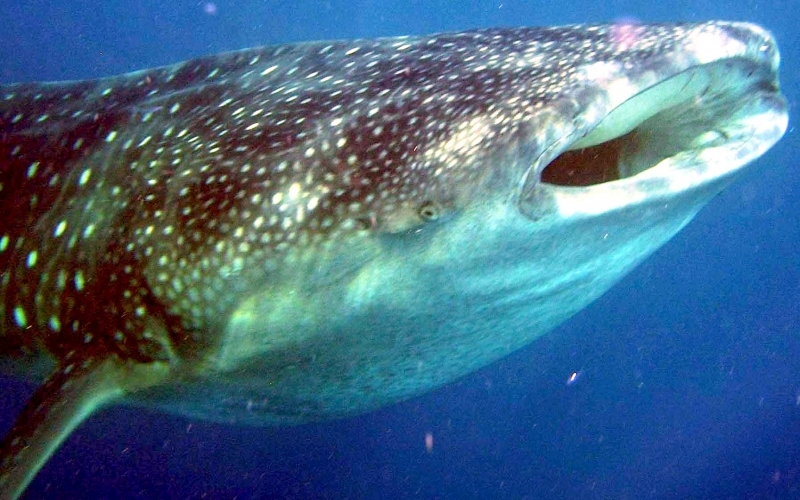 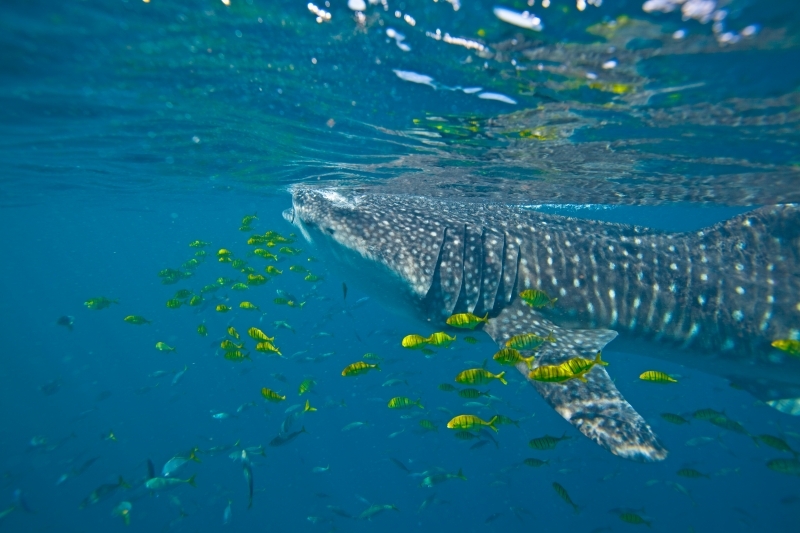 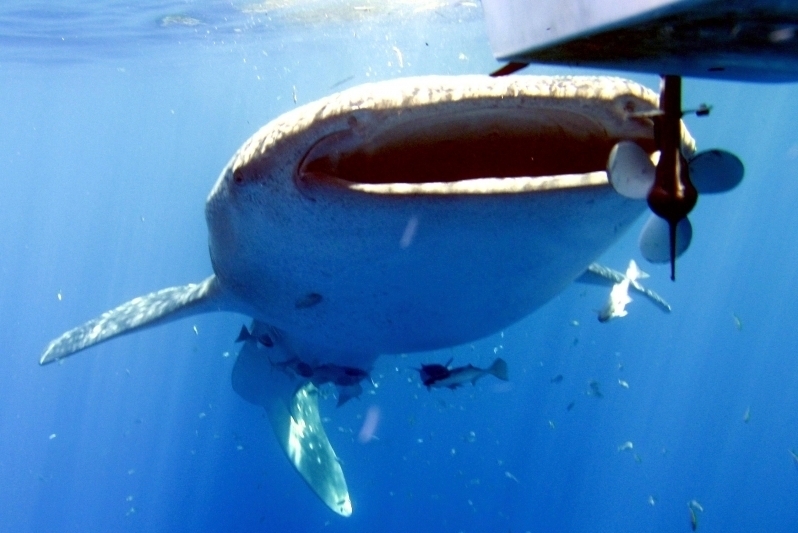 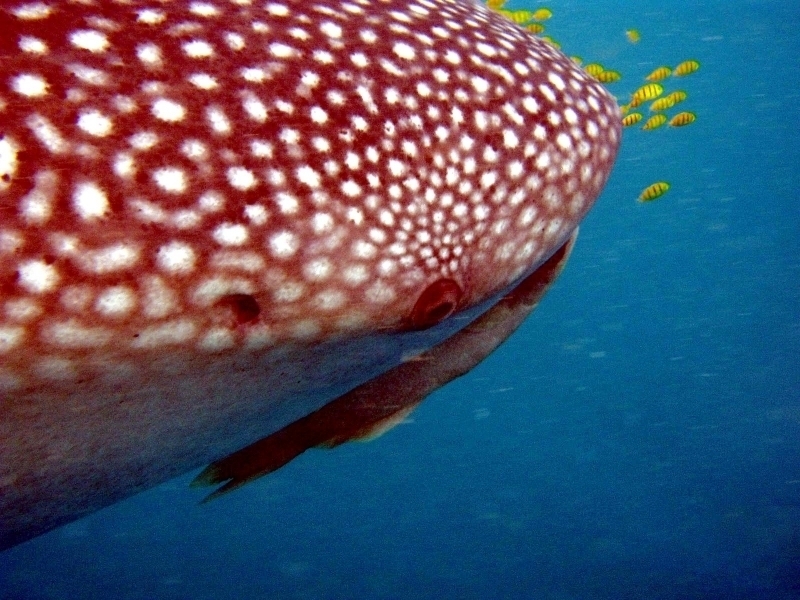 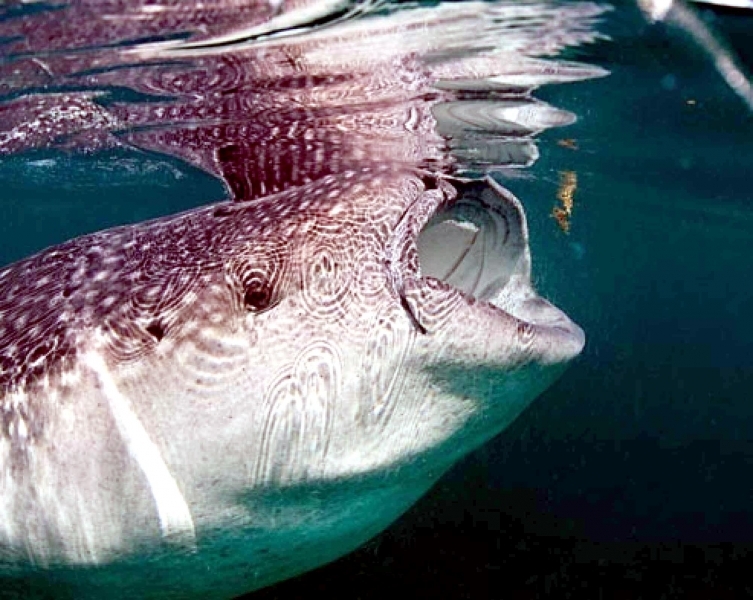 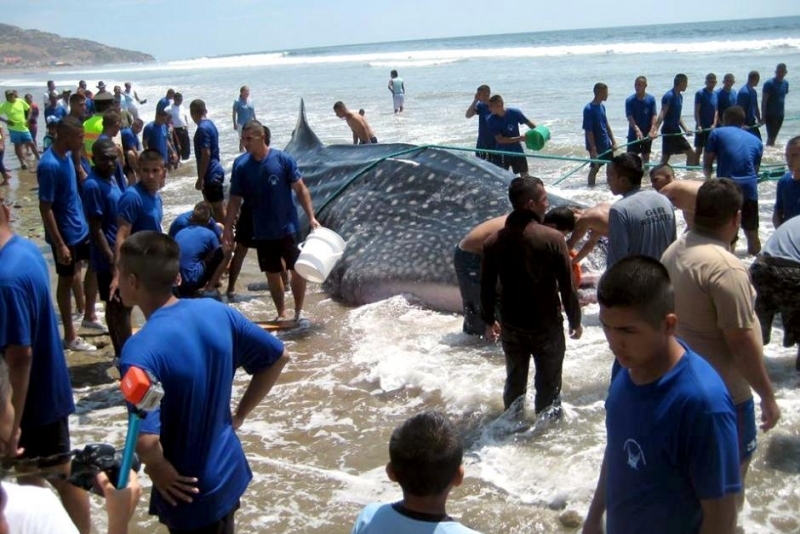 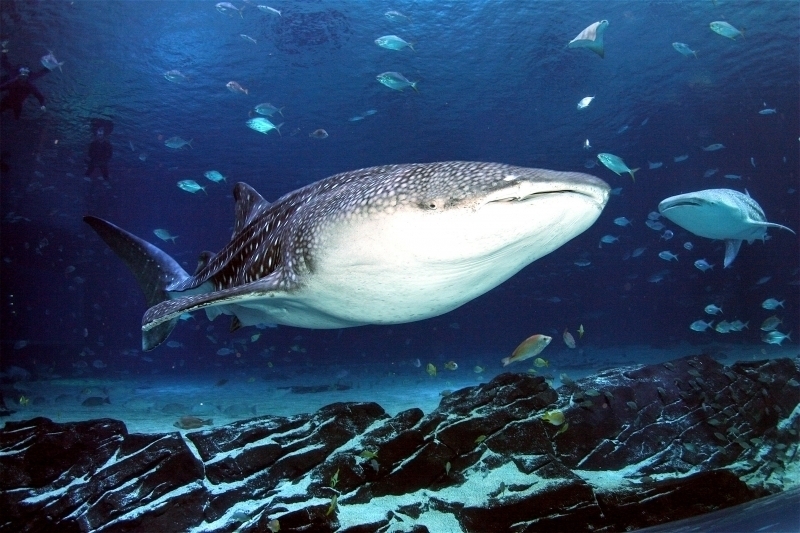 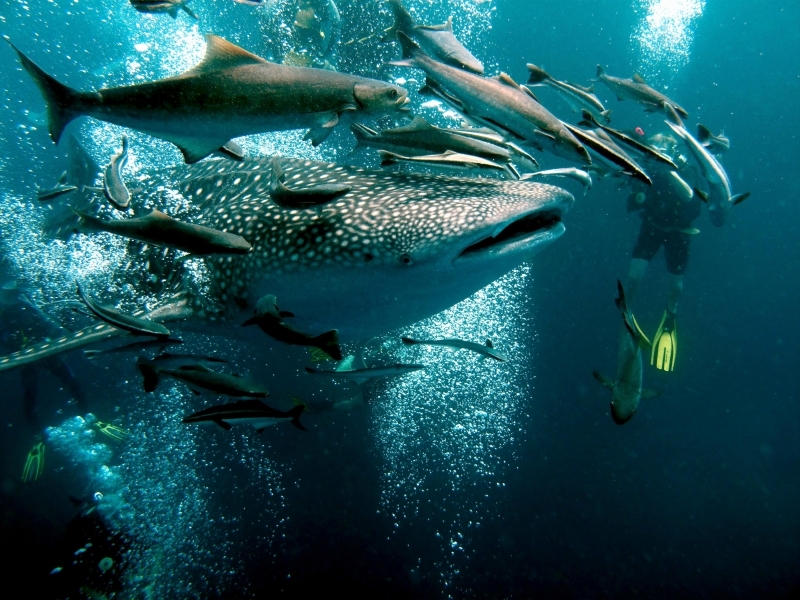 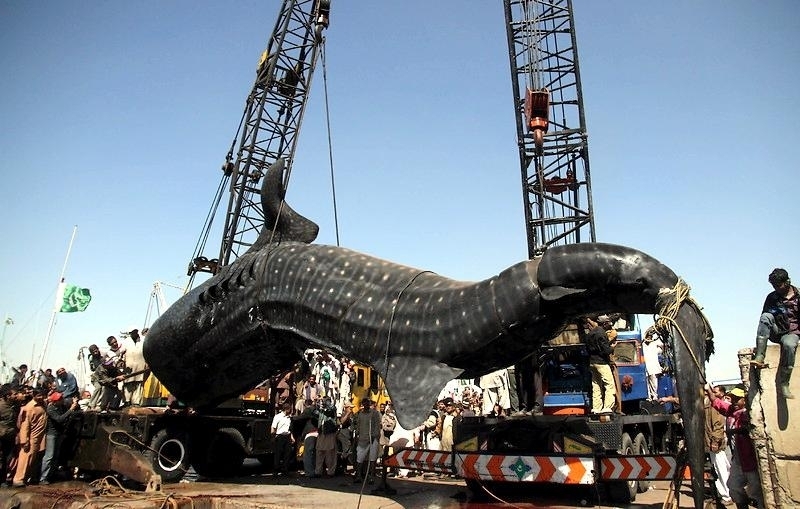 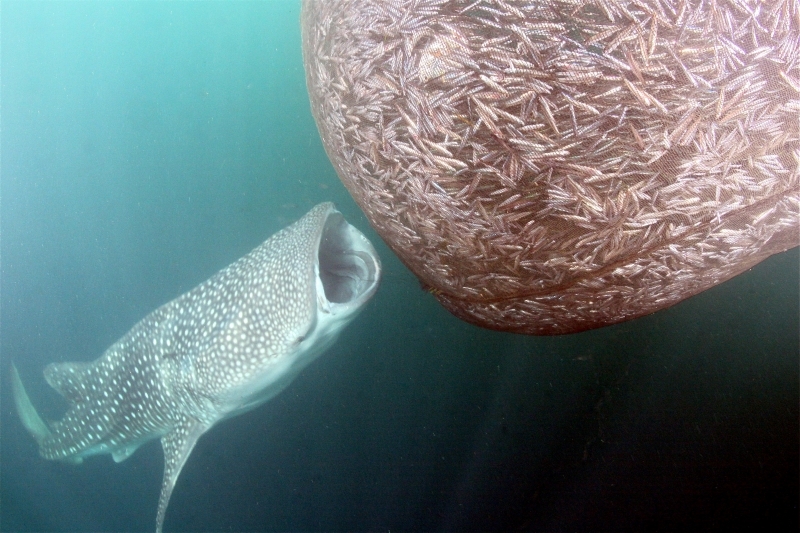 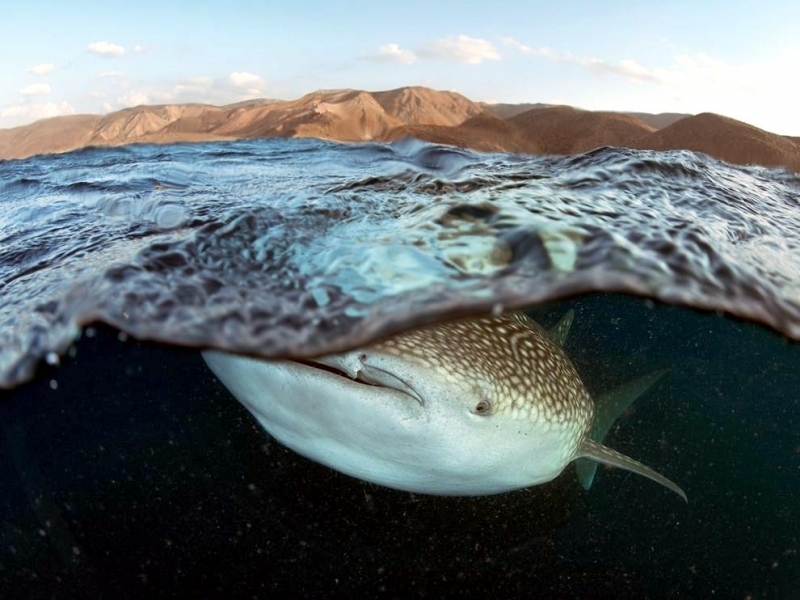 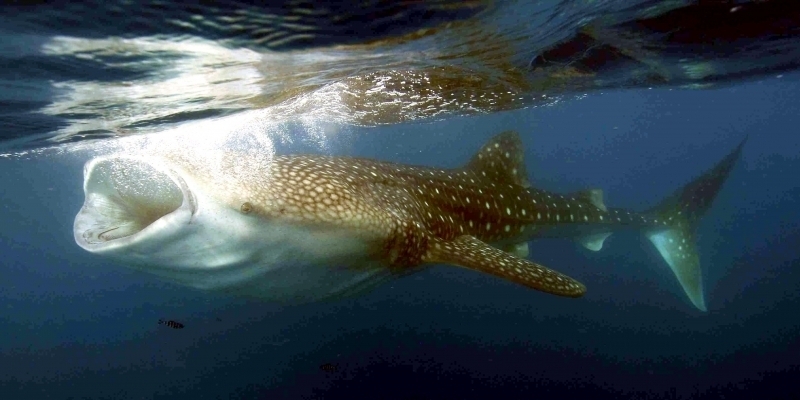 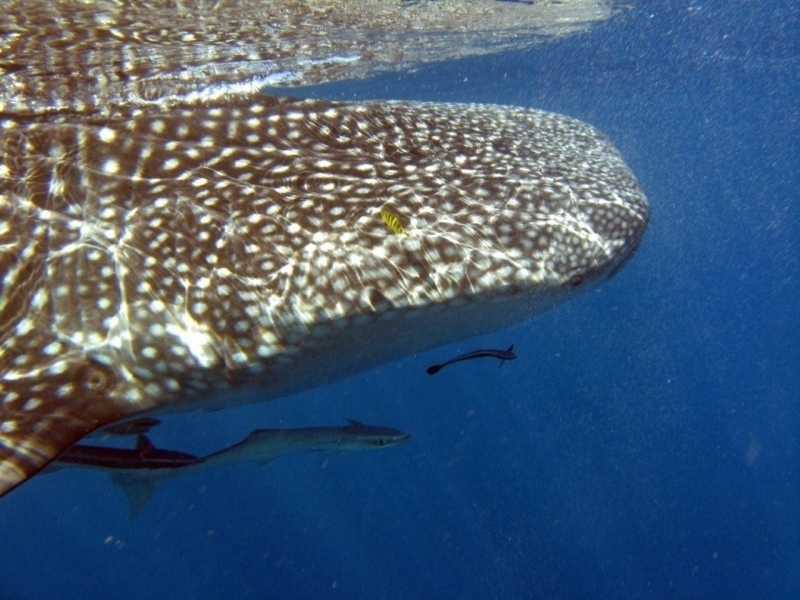 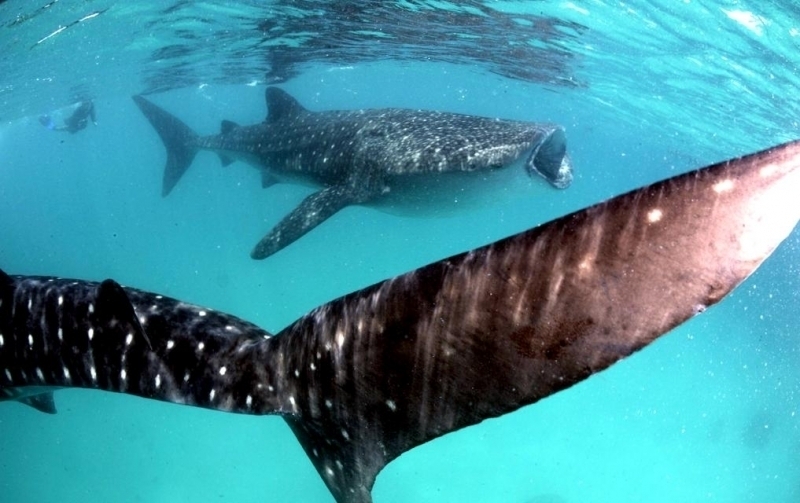 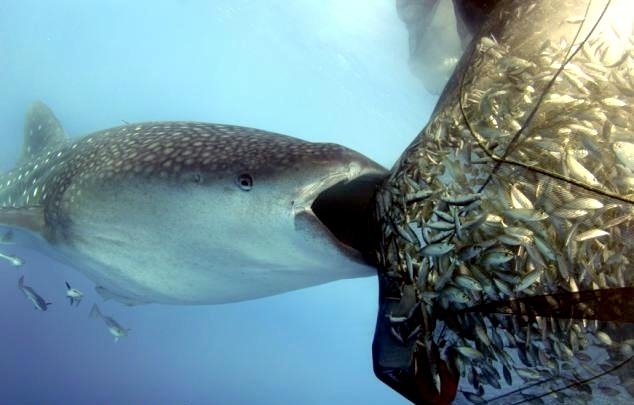 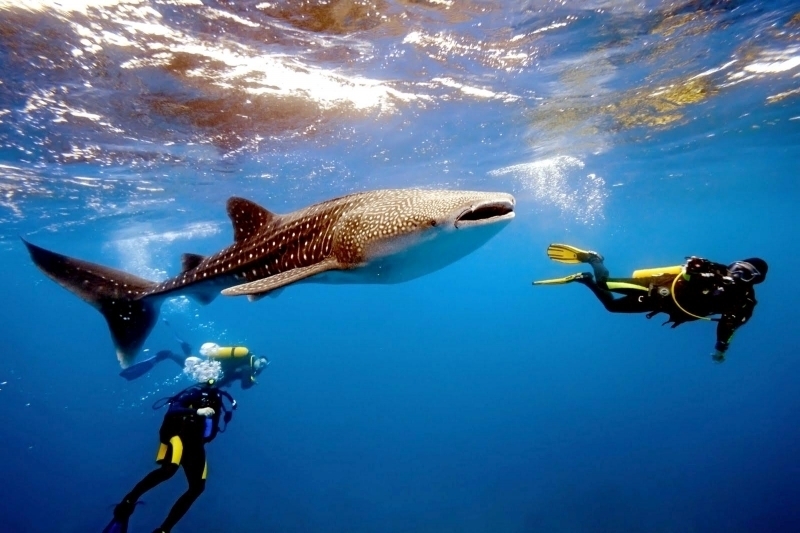 However, groups of Whale Sharks are seen seasonally at certain sites during plankton blooms or mass coral spawnings. 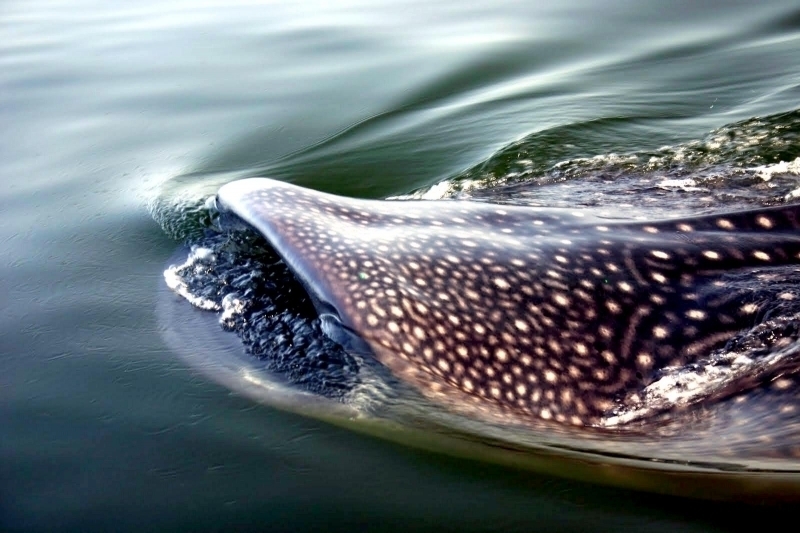 They are slow swimmers at speeds of no more than 5 kph. 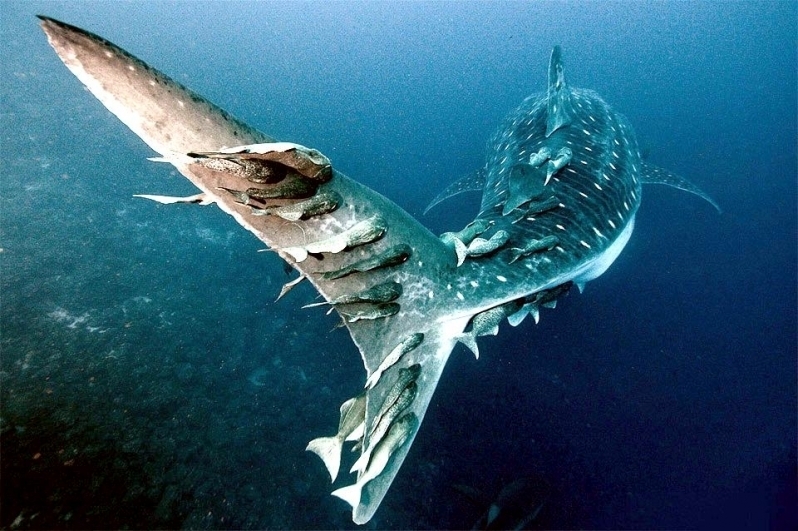 They swim by moving the posterior 2/3 of their bodies from side to side not just their tails, like Great White Sharks and certain other sharks. 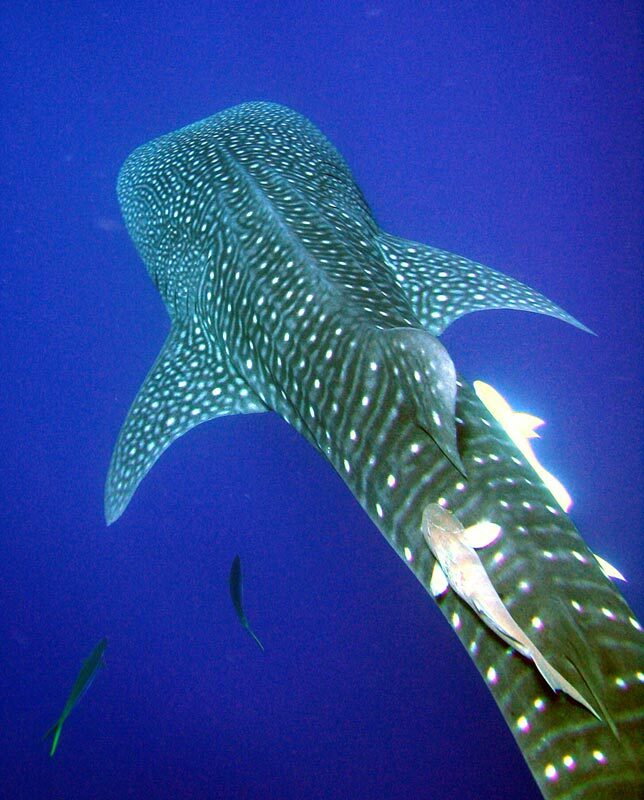 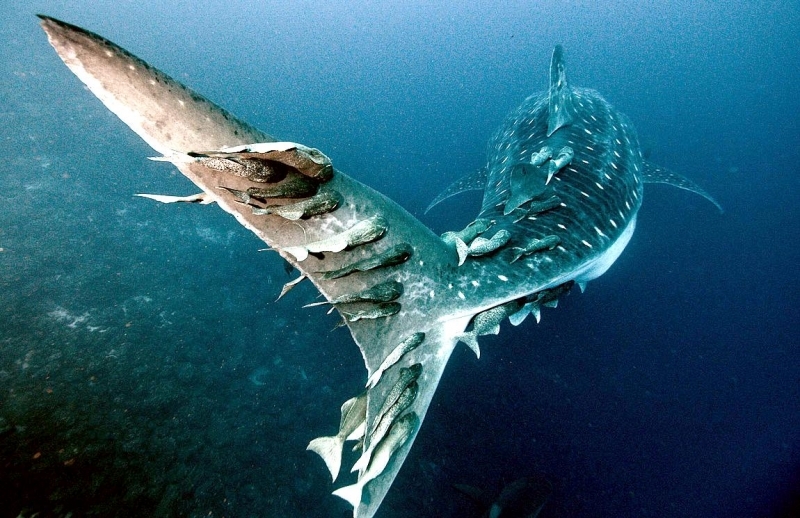 Whale Sharks are not aggressive toward people and usually indifferent to divers, but an accidental blow from the powerful tail has caused serious injury.